The official sign-up season for President Barack Obama's healthcare law may be over, but leading congressional Democrats say millions of Americans facing new tax penalties deserve a second chance. Three senior House members said that they plan to strongly urge the administration to grant a special sign-up opportunity for uninsured taxpayers who will be facing fines under the law for the first time this year. This year is the first time ordinary Americans will experience the complicated interactions between the healthcare law and taxes. Based on congressional analysis, tax preparation giant H&R Block says roughly 4 million uninsured people will pay penalties. The IRS has warned that health-care related issues will make its job harder this filing season and taxpayers should be prepared for long call-center hold times, particularly since the GOP-led Congress has been loath to approve more money for the agency. "Open enrollment period ended before many Americans filed their taxes," the three lawmakers said in a statement. "Without a special enrollment period, many people (who will be paying fines) will not have another opportunity to get health coverage this year. "A special enrollment period will not only help many Americans avoid making an even larger payment next year, but, more importantly, it will help them gain quality health insurance for 2015," the lawmakers added. So far, administration officials have deflected questions about whether an extension will be granted. Health and Human Services Secretary Sylvia M. Burwell has authority to grant special enrollment periods under certain circumstances. Supporters of the law say an extension would mainly help low- to middle-income uninsured people, the same group that Obama's coverage expansion was intended to serve. But Republicans may criticize it as another tweak to what they see as unworkable "Obamacare." The healthcare law imposes fines on uninsured people whose incomes are deemed high enough to enable them to afford coverage. The goal is to broaden the pool of insured people, helping to keep premiums in check for everybody. The law also offers subsidies to lower the cost of private coverage for people who don't have job-based healthcare. That financial assistance is provided through a new tax credit. Although the tax credit subsidies cover most of the premiums for many people, the coverage requirement and the fines that enforce it remain deeply unpopular. And the cost of being uninsured in America is going up significantly. For 2014, the fine was the greater of $95 per person or 1% of household income above the threshold for filing taxes. That fine will be collected when taxpayers file their 2014 returns. But this year the fine will jump to the greater of 2% of income or $325. By 2016, the average fine will be about $1,100, based on government figures. Polls show that many taxpayers are unaware of the potential financial exposure. Floyd Cable, a real estate agent from Wichita Falls, Texas, said the escalating fines were part of the motivation for him and his wife to sign up last week. Both are self-employed, and stretching to pay health insurance premiums has been a struggle. "We have been going without insurance the last couple of years just because the rates are so astronomical," Cable said. But they were also concerned they could wind up on the wrong side of rising penalties. And, being in his early 60s, Cable said he recognizes the value of having health insurance against unexpected illness. An extension would probably help people still on the fence, like he was. "Anything that could be done to give people more time to sort through this, is not only a good move for the administration, but just makes common sense," Cable said. 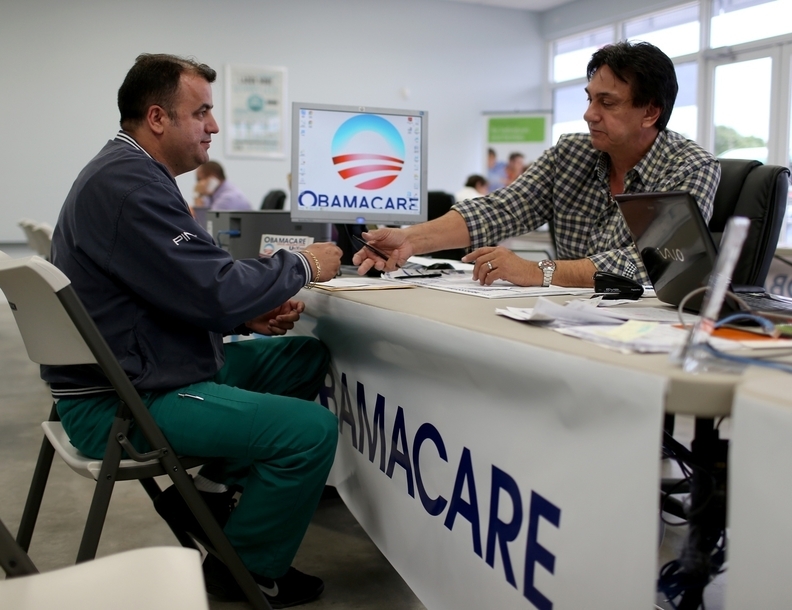 Since both the subsidies and penalties under the health law are administered through the tax system, some experts have urged the Obama administration to permanently schedule sign-up season to overlap with tax-filing season.